Home BOLLYWOOD Is Sushant Singh Rajput’s Tweet On IIFA A Dig At Shahid Kapoor? 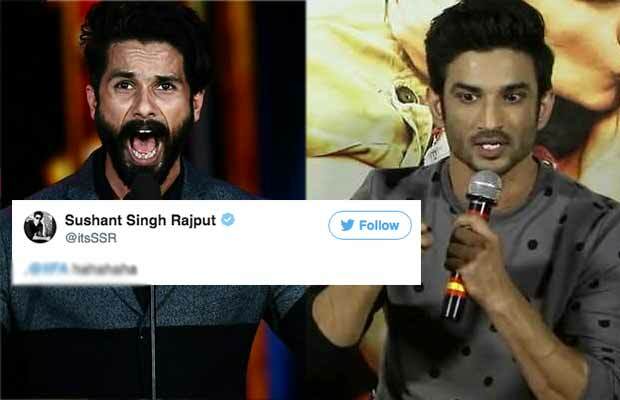 Is Sushant Singh Rajput’s Tweet On IIFA A Dig At Shahid Kapoor? Sushant Singh Rajput laughs off at IIFA, people guess it is because of Shahid Kapoor! The TV actor turned Bollywood celeb Sushant Singh Rajput is known for falling into controversies for some or the other reason. Even at the release time of his film ‘Raabta’, he fell into controversies. One was after indulging into a fight with a senior journalist on the trailer launch of the film. The other one was when he was asked about the plagiarism charges on his film. It was not very late when the people started trolling him for his tweet. According to many Twitter users, SSR’s tweet was a dig at Shahid Kapoor winning the IIFA award in the category of the Best Actor (Male). Let us inform you all that even Sushant was nominated in the same category for his film ‘MS Dhoni: The Untold Story’. But sadly he couldn’t win the title. People think that his tweet was in reference to same. Well, we do not know what the truth is or what was the real reason behind the actor’s tweet. But the common people have derived their own meaning from it. And it cannot be cleared unless the actor himself comes up and gives a clarification on the same. Talking about the work front of the actor, Sushant Singh Rajput is going to be seen in the film ‘Chanda Mama Door Ke’. He is also going to work with Sara Ali Khan in the film ‘Kedarnath’. Previous articleHere’s Why Sidharth Malhotra’s Aiyaary Is One Of The Most Anticipated Films Of 2018!